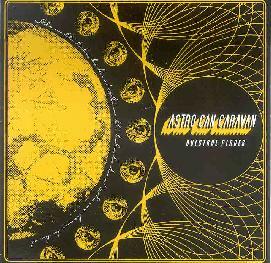 Astro Can Caravan - "Questral Places"
Who would have thunk it - A humongous Finnish jazz ensemble, released by an offshoot of the Bad Vugum imprint, best known for such crazy noise rock groups as Radiopuhelimet and Circle? Weird! Seventeen members, with luminaries from Aavikko and Deep Turtle (a note to fans of Lightning Bolt, Ruins and the like: check out Deep Turtle) filling out the ranks, mixing freedom chase with large compositions of epic grooving jazz. This reminds me in equal bits of the large ensemble works of Mingus, electric era Miles Davis, Sun Ra’s outer space journeys, and even a bit of early 70’s Soft Machine. The rhythmic underbelly is definitely rooted in rock, especially the opening couple songs ("Helios Universal" and the ripping "Mohenjo Daro"), but they can really swing as well, and get pretty free and noisy when the spirits move em, as on "Second Astral Movement". For compositionally oriented jazz they are a pretty adventurous crew, adding electric piano, oscillators and other electronics, electric guitar, and weird noisemakers to compliment the proceedings. Unlike most contemporary underground jazz they actually keep things pretty short, with almost all of the tracks coming in under the 6-minute mark. People who don’t have the patience or endurance to hang on through those 1-track 50+ minute free improv CDs, who need a bit of melody to grab onto, will enjoy these folks. They really are exceptional, and worth the effort to track down, as I imagine it might not be easy to find since Bad Vugum releases do not seem to be all that well distributed. They included a 5 song CDR that is a preview of some newer material, and it is every bit as good as the CD, maybe better. Anyone want to start a record label? Questral Places is distributed by Bad Vugum. You can visit their web site at: http://www.badvugum.com.